I’ve found that the perfect lunch idea is a Buddha Bowl Recipe because I’m able to get tons of nutrients mid-day which allows me to power through the rest of my day. Plus, I can feel full afterwards. My recent craving for Greek flavors inspired this Greek Buddha Bowl Recipe, which is still packed with nutrients, but has a bit more healthy fats thrown in. This is a sponsored post on behalf of SquattyPotty. All opinions are my own. A buddha bowl recipe usually starts with a leafy green base that then incorporates seasonal vegetables, a grain, a protein and some healthy fats. With our twist on the buddha bowl recipe to add in some Greek flavors there’s a bit more healthy fats, but it’s definitely still a recipe I can feel good about eating. Beside who can resist tzatziki?! I swear I would put it on just about anything. It’s that good! Leafy greens – spinach, kale, swiss chard, arugula and spring mix. Vegetables (roasted, cooked or raw) – zucchini, sweet potatoes, squash, eggplant, brussel sprouts, beets, carrots, peas, red cabbage and broccoli. Grains – quinoa, brown rice, or farro. Protein – tofu, chickpeas, edamame, tempeh or beans. Our recent switch to more plant-based foods has us in the bathroom a bit more. I know it’s not something that everyone likes to talk about, but with two little girls in the house I don’t want them being ashamed or feeling uncomfortable when they need to go number two. We’ve gone down the road of having painful bowel movements in the past and I would prefer not to head down that road again. Luckily, we’ve partnered with SquattyPotty to make everything easier (pun intended). 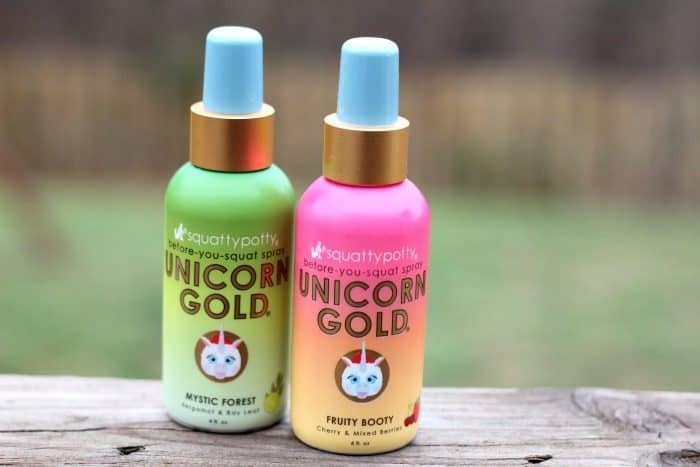 Not only do we love our SquattyPotty stool, but their Unicorn Gold is a lifesaver. My girls love the fact that they don’t stink up the bathroom when friends are over. Plus right now SquattyPotty is giving all of you 15% off their products! If you don’t have a SquattyPotty stool yet then this is the time to get one. The name buddha bowl comes from the fact that it is made in a bowl and that the bowl is often overflowing giving it the appearance of a buddha’s belly. There truly is no wrong way to make a buddha bowl. 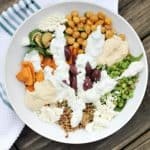 In order for a buddha bowl recipe to qualify as vegan, you would need to use vegan ingredients that do not come from an animal. The protein source in a buddha bowl recipe can also be chicken, beef or fish, but this is not the traditional form. 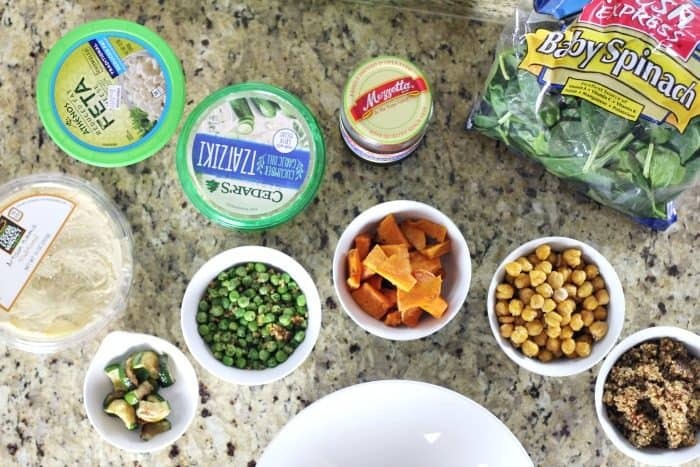 Creating a buddha bowl recipe is the perfect way to clean out your refrigerator. 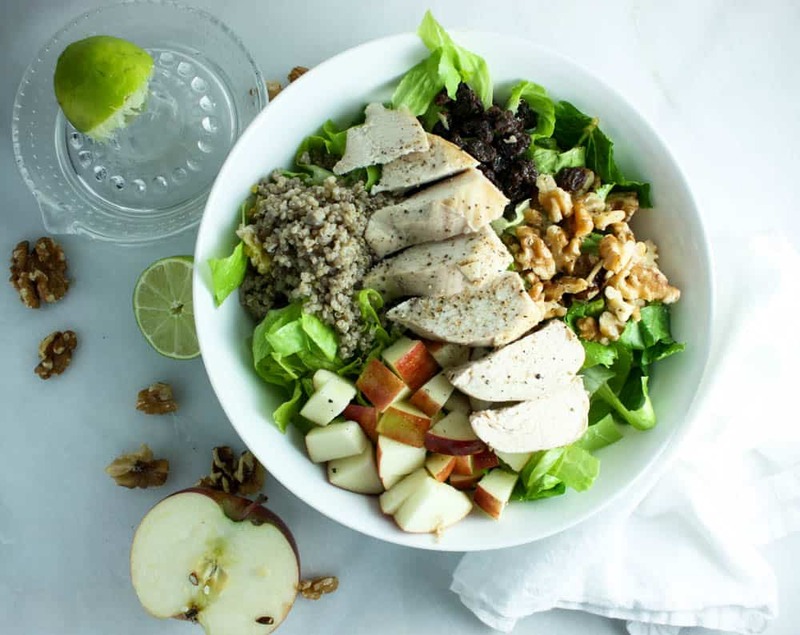 The buddha bowl should consist of a leafy green, vegetables, a grain, protein and healthy fats. You can change the flavor of your buddha bowl recipe by using specific spices and seasoning on your vegetables. 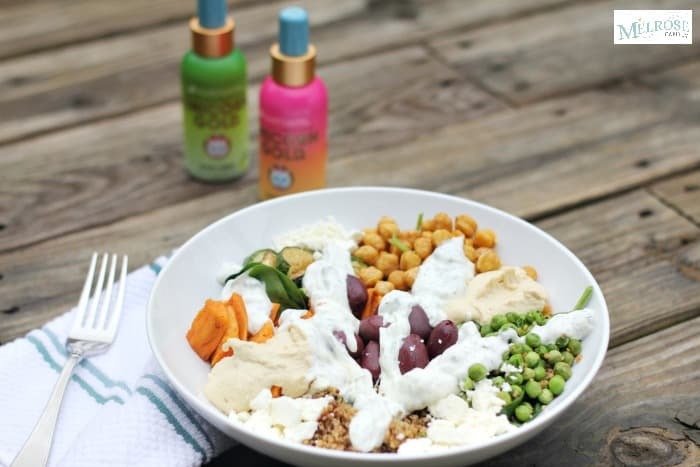 Nothing quite says a nutritious and delicious lunch like a Greek Buddha Bowl recipe. This buddha bowl is bursting with seasonal roasted vegetables and is packed with protein. It is the perfect lunch to leave you feeling full. 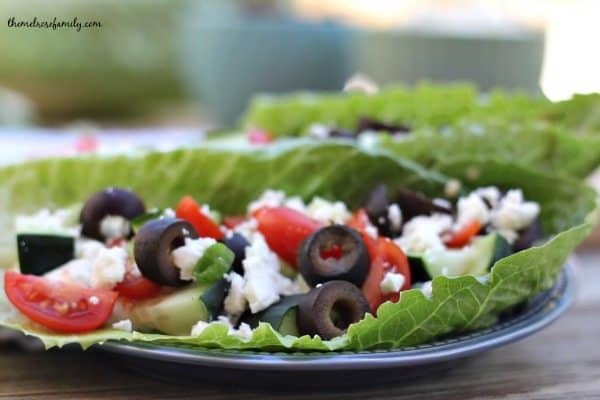 A Greek Buddha Bowl recipe starts with leafy greens. The second layer includes roasted vegetables and quinoa. 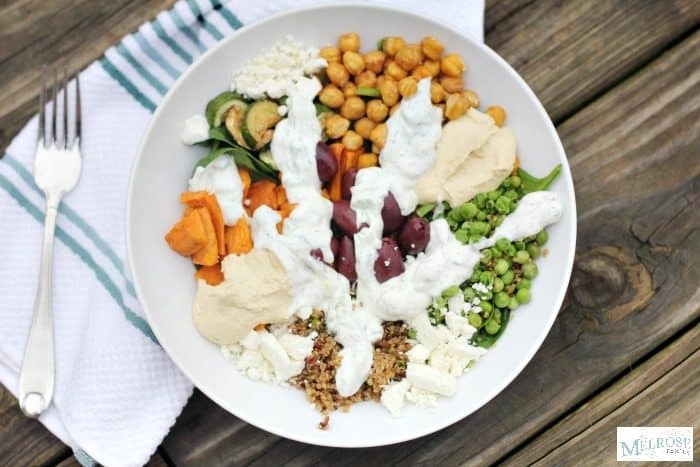 The Greek Buddha Bowl is finished with tzatziki, hummus and feta cheese. Preheat the oven for 450 F.
On a baking sheet place the chopped sweet potatoes and zucchini and drizzle with olive oil and sprinkle with sea salt. In a separate baking sheet place the chickpeas and drizzle with olive oil and sprinkle with sea salt. Place both baking sheets in the oven and roast until the vegetables are soft. Place the spinach in the bottom of the bowl. Add the roasted vegetables, cooked peas and quinoa on top of the spinach. Top the vegetables with the olives, feta cheese, hummus and drizzle tzatziki over the top. 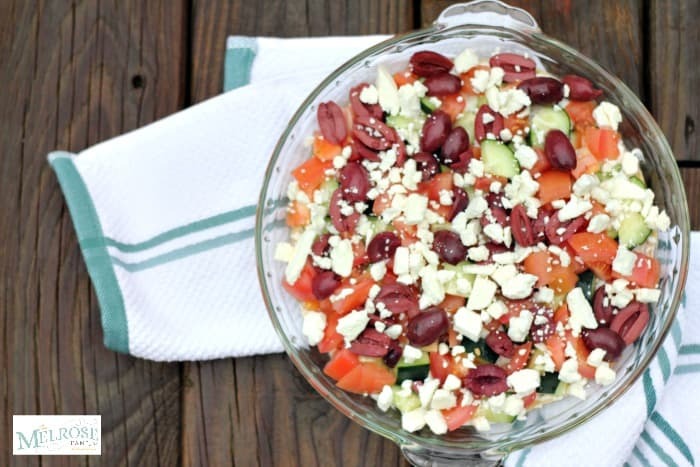 If you liked this Greek Buddha Bowl recipe you might also like…. From left to right: Greek Yogurt Dip, Vegetarian Greek Lettuce Wraps & Apple Walnut Salad. The key to eating a healthy lunch is to plan ahead. Prepping a few of these bowls ahead of time is the way to go. It will prevent you from running out to buy an expensive lunch every day!